Monotherapy or Combination Therapy with Adalimumab? Since the introduction of anti-tumor necrosis factor therapies (anti-TNFs), the benefit of using these agents in combination with immunomodulators or as monotherapy has shifted a few times based on the latest studies. The most influential recent studies had been SONIC and UC Success which indicated that combination therapy for Crohn’s and Ulcerative Colitis, respectively, was more effective and without more adverse effects than monotherapy. A recent study may create some additional uncertainty in this line of thought (Gastroenterol 2014; 146: 941-49). The author performed a pooled analysis of data from 1594 patients with Crohn’s disease (CD). Studies included CLASSIC I and II, CHARM, GAIN, EXTEND, and ADHERE. In total, these studies provided 3050 patient-years of exposure. For individual patients, the median followup period was 1.5 years. “Those patients receiving combination therapy had an increased risk of malignancy (other than non melanoma skin cancer [NMSC])” with a relative risk of 2.82. A related editorial (884-86) helps dissect the articles strengths/limitations as well as implications. the study captured data from randomized controlled trials. 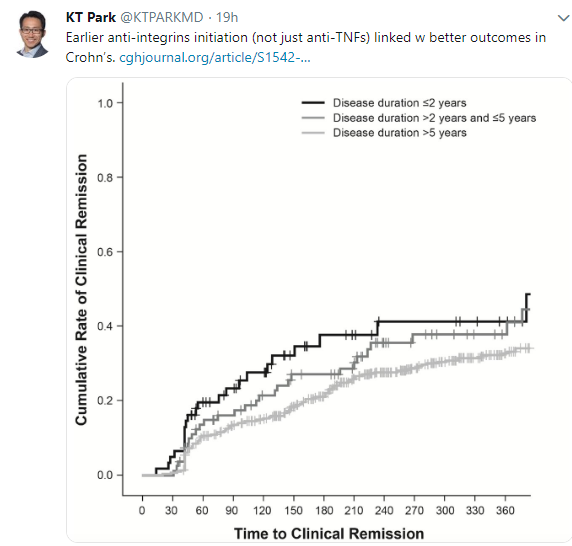 Also noted: “Risk of Cancer in Patients with Inflammatory Bowel Diseases: A Nationwide Population-based Cohort Study with 30 Years of Follow-up Evaluation” (Clin Gastroenterol Hepatol 2014; 13: 265-73). n=13,756 patients with CD and 35,152 with UC. Key findings –among CD patients, the excess risk was largely due to extra-intestinal cancers such as hematological malignancies (SIR 1.9) and smoking-related malignancies (SIR 1.5). Associations between UC and gastrointestinal/extraintestinal cancers were weaker (both SIRs were 1.1); the risk of gastrointestinal cancers decreased over the course of the study. A recent review article provides advice for management of biologics and immunomodulators when an infection or malignancy develops (Inflamm Bowel Dis 2014; 20: 926-35). Serious infections are noted in 3-5% of adults receiving either thiopurines or anti-tumor necrosis factor agents (anti-TNFs); less than 0.1% of adults develop treatment-related lymphoma. The recommendations are provided in 5 separate tables. Table 2 addresses fungal infections. Table 3 addresses viral infections (eg. CMV, EBV). For EBV, the authors recommend stopping thiopurines and not restarting in male patients. Table 4 addresses malignancy: solid tumors, hepatosplenic T-cell, EBV-associated lymphoma, and lymphoproliferative lymphoma. Table 5 addresses skin cancers. Bottomline: This is a useful advice/handy reference for the sticky situation of managing IBD in the face of infections and malignancy.